DEFTSOFT is a renowned company that has made its mark in the field of Web Designing and Digital Marketing for more than a decade. We have served our clients with our innovative and expert technical solutions that helped them to achieve their business goals successfully. Our professionals specialize in Web Development, Mobile Development, Digital Marketing, Product Development, and Software Testing. Our prime focus is the complete satisfaction of our clients by providing them robust and intuitive services. 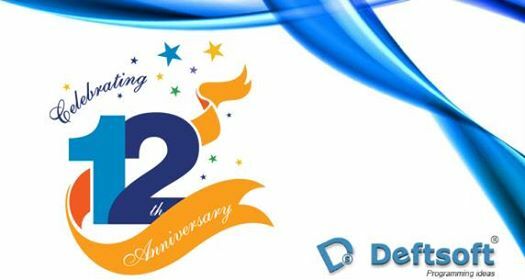 Recently, DEFTSOFT completed its 12 years of excellence in the field of Information Technology. We celebrated our 12th Anniversary by organizing an event that will be remembered for a long time. The honorable CEO of our company Mr. Amaneet Brar addressed the complete Deftsoft Family of over 250 employees with his motivational speech on the significance of hard work in our lives. He, along with the Managing Director of the company Mr. Amaninder Brar and other Managing Heads inaugurated the event with the cake cutting ceremony. All the Managers from different departments shared their journey with Deftsoft and reflected the milestones that the company has achieved in these 12 years. This event turned exciting when our HR department organized amazing contests for the employees. The employees participated actively and the winners were awarded by the management team. This inspirational and fun-filled event raised the hopes and aspirations of the employees for the company to work with more enthusiasm and achieve more success. This was followed by the refreshment treats which everyone enjoyed with their colleagues. All-in-all it was a splendid experience, a great way to unite the complete working staff, and motivating the employees for the better future of the company.